In the Star Wars timeline, The Mandalorian is to be set after the events of Return of the Jedi but before the rise of the First Order, which means that it could well give us a pretty good idea of what became of the Imperial Army after the fall of the Empire. 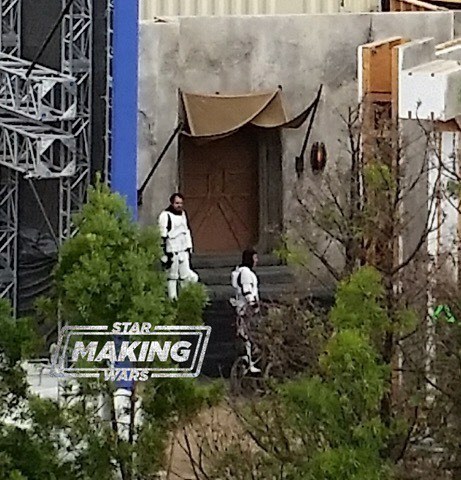 This is what’s suggested in a new set pic leaked to MakingStarWars.net, which provides us with our first ever look at Stormtroopers in the aftermath of the Original Trilogy. The un-helmeted pair featuring in this photo are seen standing around the stone wall structure that was previously speculated to be part of a bazaar or marketplace. They may not be doing much, but the fact of their existence post-Return raises enough questions that Jon Favreau’s TV series will hopefully answer. This is just the latest of several images we’ve been privy to in the last week or so. Just recently, we got our first glimpse of the project’s title character in their Fett-style helmet. Since then, a few more set pics have shown a couple of costumed characters looking equipped for a fight, and we’ve even spotted our first alien from the show. As filming continues in Southern California, you can expect a few more photos to surface online, but what we’re really waiting for is some official info on the spinoff, be it further plot details or some casting announcement. An early, vague synopsis of The Mandalorian speaks of “a lone gunfighter in the outer reaches of the galaxy far from the authority of the New Republic,” which sounds like a pretty good place for members of the old Empire to hide out, too. But just what sort of adventures we can expect to unfold in these remote parts remains to be seen.